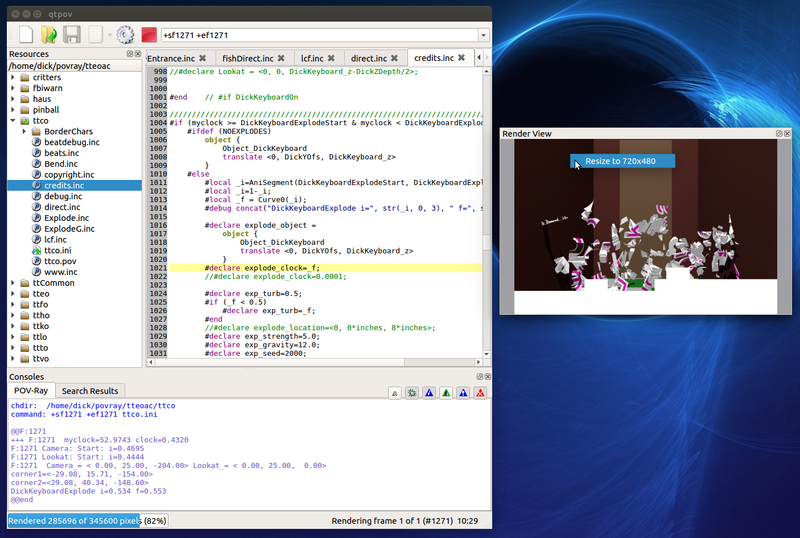 The Render View window shows you the output of POV-Ray as it is rendering your image. This is a preview and may not equal the final output. Use a proper image viewer after rendering to insure you are seeing all of the minutiae in your image, tranparency, gamma, etc. Render View is a resizable, dockable window. If you want to see a larger copy, either expand it in place, or undock the window. There are several ways to undock the window. Double-click the header where it says Render View. Grab the header and drag it to your desktop. Click the tiny "multi-window" icon in the header (next to the close icon). The Render View will maintain the original aspect ratio of your image regardless of the shape of the window. When undocked, there is a context menu available. Currently, the only option is to resize the image to its natural size.